If you have noticed a sudden change in your browser's default settings, it could be an indication that a browser hijacker is up and running on your personal computer. One application of this classification is known as Strixchase.com and happens to be roaming the web nowadays. If this program is already up and running on your personal computer, be sure not to waste any time and execute its complete removal right away. We urge you to do so because this devious piece of software can only make surfing the web an annoying and bothersome task. On top of that, in some cases, this browser hijacker could prove to be dangerous and potentially malicious. If you want to learn more about the complex inner working of this intrusive program, be sure to read the rest of our detailed article. Alongside such information, we also include a detailed removal guide that will help you delete Strixchase.com in just a few simple steps. It is important to note that Strixchase.com affects major web browsers such as Google Chrome, Internet Explorer, and Mozilla Firefox. Such broad compatibility signifies that a large number of users could be affected by it. Therefore, being aware of its existence is critical. The browser hijacker in question starts doing its dirty work as soon as it gains successful access to your operating system. Like a lot of other hijackers of today, this one modifies data linked to your browser's default settings. Once those modifications are in place, you will notice devious changes in your browser's default settings. One of the most annoying things in regards to all of this is that you are not notified or asked to authorized the change of your default home page. At first, an alteration of your default home page might not seem like a big deal; in reality, it will have a negative effect on the way you experience the Internet on a daily basis. Having, this hijacker fully up and running on your PC, means that you will be presented with a questionable third-party web site every time you will start an online session, whether you want that or not. It goes without saying that due to this, you will not be able to surf the web the way you like. To regain your browser's default settings once and for all you must perform a complete removal of Strixchase.com; if you fail to do so, the intrusive alteration will continue to bother you. Unfortunately, there something much more alarming about Strixchase.com than the annoyance that it causes. During the extensive analysis, our malware experts have discovered that in quite a few cases this browser hijacker is spread via bundled installers. That is a dangerous instance because other questionable programs could come along with it. Therefore, it is a good idea to check your entire operating system for any other dubious applications if you already have the hijacker in question active on your PC. Furthermore, our malware experts highly advise you to stay away from the search box on the newly assigned home page since it could present you with modified results. Some of them could host redirect links that might lead you to devious third-party web sites. For example, you could end up on a web page that host malicious software. In some cases just entering such a site could be more than enough to infect your personal computer with some unknown malware. In other instances, you could find yourself on a fake online store. Cyber criminals craft such devious stores with a sole purpose of stealing your personal computer. 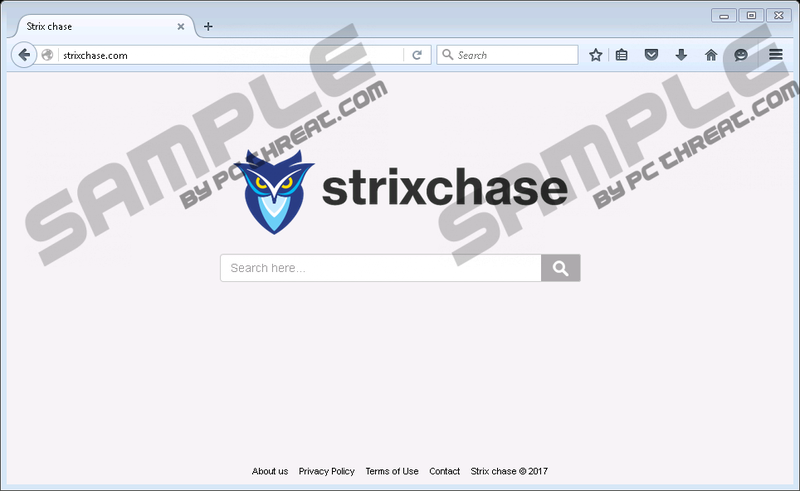 As you can see, Strixchase.com could prove to be a major virtual threat. If you value your virtual security, you must delete this hijacker as soon as it is found up and running on your PC. Make sure to follow the detailed removal instructions with care to delete Strixchase.com in its entirety. Keep in mind that only a complete removal will help you restore your web browser's default settings. If any traces remain active on your PC, you might have to face devious outcomes. That is so because just a few leftovers linked to Strixchase.com could initiate its silent restoration. In other situations, traces might be just enough to maintain the suspicious change in place. To avoid finding yourself in such a situation, we advise you to recheck your operating system for anything related to Strixchase.com once you have carried out the instructions below. Go to C:\Users\(your username)\AppData\Local\Google\Chrome\User Data\Default. Navigate to C:\Users\(your username)\AppData\Roaming\Mozilla\Firefox\Profiles\(unique Mozilla profile ID). Quick & tested solution for Strixchase.com removal.